Summary: (Part 1) A brief review of my year with Parkinson’s. (Part 2) An overview of 12 scientific research studies on Parkinson’s from 2016. Life with Parkinson’s: 706 days ago I started this blog ‘Journey with Parkinson’s’; and it’s been a remarkable journey through time since then. Life is full, rarely a dull moment. Dealing with a disorder like Parkinson’s is difficult because it slowly creeps around your body, somewhat stealth by nature but always ever present. It requires a daily inventory of body movements, mental capacity and overall self-feelings compared to the day-week-month-year before. Life is loving, fun, intellectually challenging, active, full, rarely a moment off; however, its best that way for me. I close this paragraph by repeating two quotes from last year. They remind me to simply try to live as best as I am able for as long as I can. My hope for you is likewise as well; keep going, keep working, stay active, stay the course. Please make a manageable life-plan/contract with your care-partner, family and close friends; keep going, and please don’t give up. My year with Parkinson’s: To highlight my 2016, I’ve chosen 1 event/month to describe (not mentioned are the trips to the beach/vacation with Barbara, golf with the golf buddies, and other activities related to education, research and outreach for Parkinson’s.) I am a very fortunate person. (JAN) The 22nd year/class of undergraduates taking my spring semester course on ‘Biology of Blood Diseases’, great fun! (FEB) An anniversary dinner with Barbara, a most loving person and the best care-partner. (MAR) Started work on the WPC Parkinson Daily (eNewspaper) for the World Parkinson Congress). (APR) Compiled all of the quotes from the students in class that led to the Kindle version (2016)/Paperback version (2017) of “A Parkinson’s Reading Companion” (Click here to read about it). (May) Graduation ceremonies are always on Mother’s Day weekend; it is filled with joy and regalia, promise and the future ahead for all of the graduates (typically, I attend the medical school ceremony on Saturday and as many undergraduate ceremonies on SAT-SUN my schedule permits (picture above is from the Dept. Biology commencement). (JUN) A weekend in the Smoky Mountains in Asheville, NC: to attend a Parkinson’s retreat, to relax-renew-play golf, and to get a second Parkinson’s-related tattoo. (JUL) A weekend in Greenville, SC to participate and get certified in PWR! (Parkinson Wellness Recovery); an amazing experience (click here to read blog post about it). (AUG) Truly a professional highlight of my career being chosen by the medical students to deliver the 2016 Richard H. Whitehead Lecture (click here to read blog post about it). (SEP) Attended and presented a poster at the 4th World Parkinson Congress (WPC) in Portland, OR (click here to read about the WPC). (OCT) Moving Day® NC Triangle, National Parkinson Foundation; great team and such a fun day/experience (click here to read about NC Triangle Moving Day). (NOV) Research proposal submitted on the role of proteases and their inhibitors, alpha-synuclein and exercise in Parkinson’s. It is something I’ve been thinking about all of last year (click here to read about the funding program). (DEC) Finished teaching the 3rd class of the Honor’s-version and fall semester of the undergraduate ‘Biology of Blood Diseases’ course; a great honor for me. Parkinson’s with a hopeful future: To live successfully with a chronic and progressing neurodegenerative disorder like Parkinson’s requires much, but in the least it takes hope. We must remain hopeful that advances in Parkinson’s treatment are being made and that our understanding of the science of Parkinson’s is continuing to evolve. Parkinson’s research: Parkinson’s is the most prevalent neurodegenerative movement disorder. According to PubMed, there were 6,782 publications in 2016 that used “Parkinson’s disease” in the Title/Abstract. Likewise in 2016, PubMed had 9,869 and 1,711 citations on Alzheimer’s disease and on Amyotrophic Lateral Sclerosis (ALS), respectively. Most research studies move in incremental steps; we describe a hypothesis and collect the data to hopefully advance us forward. 2016, the year in Parkinson’s: To remind us of some of these forward steps in Parkinson’s research, and to add to our base-level of hope, here are 12 projects from 2016 regarding Parkinson’s (there are several studies, not mentioned here, that I’m currently working on for individual blog posts because they seemed super-relevant and in need of more thorough presentation/explanation). Although 12 is a minuscule list of citations/work reported from last year, it reinforces a simple notion that our trajectory is both positive and hopeful. January, 2016: Dipraglurant FDA-approved to treat dyskinesia. After ~5 years of treatment with the ‘gold-standard’ Levodopa/Carbidopa, many people-with-Parkinson’s develop drug-induced involuntary movement (also called dyskinesia). This can be a serious side-effect of levodopa, and it can lead to numerous detrimental consequences. The pharmaceutical company, Addex Therapeutics, has received orphan drug status for their drug named Dipraglurant, which will be used for the treatment of levodopa-induced dyskinesia. Click here to read about the putative molecular mechanism of Dipraglurant, what advantages Addex gains from the designated orphan-drug status, and for more information about Addex. February, 2016: Early detection of Parkinson’s from mouth salivary gland biopsy. There is no definitive test to identify Parkinson’s in its early stages. Finding an easily accessible tissue for biopsy to help with the diagnosis would be of value. From autopsy samples, the submandibular saliva glands in the mouth seemed to be a relevant and easily accessible site to study. The test involved inserting a needle into the submandibular salivary gland under the jaw, staining for modified-a-synuclein. The results revealed that Parkinson’s patients had increased level of a-synuclein compared to patients without Parkinson’s. Click here to view this paper: Adler, Charles H. et al. “Peripheral Synucleinopathy in Early Parkinson’s Disease: Submandibular Gland Needle Biopsy Findings.” Movement disorders : official journal of the Movement Disorder Society 31.2 (2016): 250–256. PMC. Web. 13 Feb. 2017. April, 2016: Role of Mer and Axl in immune clearance of neurons in Parkinson’s. TAM receptors are found on immune system cells and they help clear out dead cells generated by out bodies. Two of the TAM receptors, dubbed Mer and Axl, help immune cells called macrophages act as garbage collectors. This study asked whether or not the brain microglial cells (brain macrophages) had such activity through Mer and Axl. Interestingly, in mice lacking Mer and Axl, neurons regenerated much more rapidly in certain areas of the brain. Furthermore, microglial expression of Axl was upregulated in the inflammatory environment in a mouse model of Parkinson’s. These results identify TAM receptors as controllers of microglial scavenger activity and also as potential therapeutic targets for Parkinson’s. Click here to view this article: Fourgeaud, L., et al. (2016). “TAM receptors regulate multiple features of microglial physiology.” Nature 532(7598): 240-244. May, 2016: Complex genetics found in the study of Parkinson’s in human brain tissue. Genetic changes were found in Parkinson’s disease and Parkinson’s disease dementia. A team of scientists used RNA sequencing to illuminate two phenomena linked with the onset of Parkinson’s disease: specifically, differential gene expression and alternative splicing of genes. The study describes 20 differentially expressed genes in Parkinson’s and Parkinson’s dementia, comparing these with healthy controls. Genes showing over-expression included those involved with cell movement, receptor binding, cell signaling and ion homeostasis. Under-expressed genes had an involvement with hormone signaling. These results increase our understanding of Parkinson’s; furthermore, the complexity of their results suggest we may be able to achieve a more detailed diagnosis . Click here to view paper: Henderson-Smith, Adrienne et al. “Next-Generation Profiling to Identify the Molecular Etiology of Parkinson Dementia.” Neurology: Genetics 2.3 (2016): e75. June, 2016: Mutations in a gene called TMEM230 causes Parkinson’s. 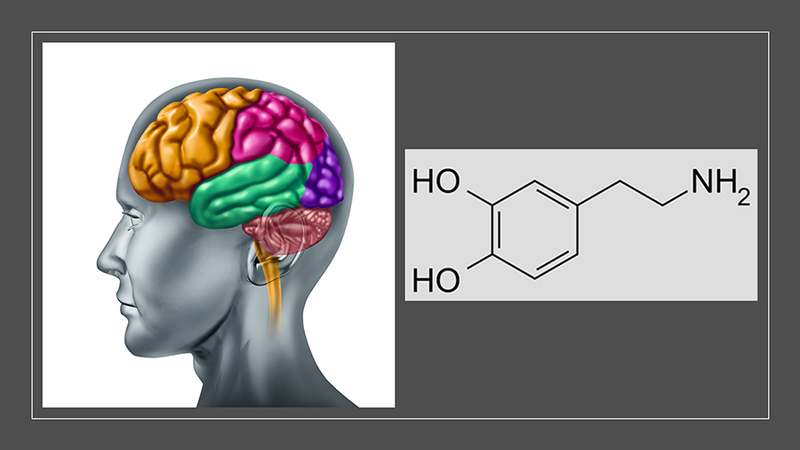 The role of TMEM230 was found to be in packaging the neurotransmitter dopamine in neurons. Interestingly, TMEM230 bridges membranes in synaptic vesicles; these vesicles are storage reservoirs for neurotransmitters. Since the loss of dopamine-producing neurons defines Parkinson’s, a defect in TMEM230 implies a new link to a genetic cause of Parkinson’s. The research team identified this mutation in Parkinson’s patients in North America and Asia. Click here to view paper: Deng, H-X, et al., “Identification of TMEM230 mutations in familial Parkinson’s disease”. Nature Genetics 48, 733–739 (2016). October, 2016: Caffeine-based compounds stop alpha (a)-synuclein misfolding in a yeast model of Parkinson’s. The aggregation (misfolding) of the protein a-synuclein is thought to be a key contributing factor in neuronal cell death that leads to Parkinson’s. The misfolded a-synuclein ultimately forms what are termed Lewy bodies, which produce much neuronal cell morbidity and mortality. Caffeine has been shown to be somewhat protective against Parkinson’s. The study here made double-headed constructs of compounds using caffeine and nicotine and other chemicals and asked whether or not they could stop a-synuclein misfolding. Possibly a far-fetched idea, 2 of the caffeine-double-headed compounds worked. These studies used a novel a-synuclein-fluorescent-green substance expressed in yeast. Expression of the green-a-synuclein misfolded and killed the yeast; however, in the presence of the caffeine-adducts, the green-a-synuclein folded properly and the yeast stayed alive. Such cool science. To read this paper, click here) “Novel dimer compounds that bind α-synuclein can rescue cell growth in a yeast model overexpressing α-synuclein. a possible prevention strategy for Parkinson’s disease”, Jeremy Lee et al., ACS Chem Neurosci. Epub 2016 Oct 7. 2016 Dec 21;7(12):1671-1680. doi: 10.1021/acschemneuro.6b00209. November, 2016: PINK1 gene mutation linked to early onset of Parkinson’s. A single mutation in the PTEN-induced putative kinase 1 (PINK1) gene has been found to promote the development of early-onset Parkinson’s. There is growing evidence that PINK1 collaborates with the protein named PARKIN; together they help regulate neuronal cell mitochondria. This interaction to regulate mitochondria (the cell’s power plant) by PINK1 and PARKIN is important because many brain disorders are known to have issues with energy production (mitochondria) besides Parkinson’s. Click here to view paper: Puschmann, A., et al. Heterozygous PINK1 p.G411S increases risk of Parkinson’s disease via a dominant-negative mechanism. Brain 2016; 140 (1): 98-117. doi: 10.1093/brain/aww261. December, 2016: President Obama signed the 21st Century Cures Act. Not a paper but a National Institute of Health (NIH) federally-supported research initiative. The Cures Act is focused on cancer, brain disease, drug addiction and other diseases/processes for the next decade. The 21st Century Cures Act contains $4.8 billion in new NIH (National Institutes of Health) funds, including the BRAIN Initiative for the comprehensive mapping of the brain. It is anticipated that we will achieve an even better understanding of Parkinson’s than we have today. Recently, a commentary about the Cures Act from the viewpoint of the NIH was published in the New England Journal of Medicine. Click here to read this article: Hudson, K. L. and F. S. Collins (2017). “The 21st Century Cures Act — A View from the NIH.” New England Journal of Medicine 376(2): 111-113.